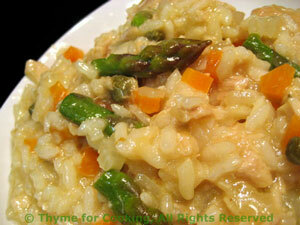 Salmon, Filet Mignon, Tuna Asparagus Risotto, are some of the main courses this week. This is based on a main course from years ago, at one of my favorite restaurants in Minneapolis. They didn't give me the recipe.... The steaks are sliced thinly, for tenderloin, and cooked quickly to stay medium-rare. Serve on a bed of mashed potatoes. The sauce: Thinly slice shallots and mince garlic. Heat 2 tsp oil in a nonstick skillet over medium heat. Add shallots, garlic and thyme and sauté 1 - 2 minutes. Add red wine and simmer until reduced by half. Add beef stock and simmer until reduced by half. Add tomato paste, mustard and mix well. Dissolve cornstarch in milk or cream and add to sauce, stirring until thick. Spoon into a bowl and set aside. Rinse out the skillet for the steaks. The steaks: Heat remaining 2 tsp oil in the skillet over medium-high heat. Add steaks and sauté 1 minute per side. 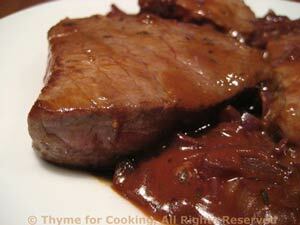 Spoon the sauce over the steaks, cover and simmer 1 - 3 minutes longer, depending on how you like them done. To serve: Put 2 steaks on each plate and spoon a little sauce over top. Put the rest of the sauce in a sauce boat and serve on the side. 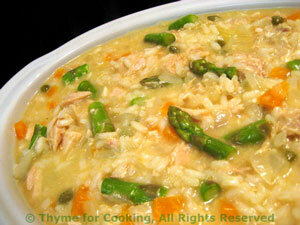 Tuna, capers and asparagus make a wonderful risotto for spring; all cooked in the same pot to make it even easier! It will continue to absorb liquid and the leftovers (if any) will be quite stiff. The risottos that we have eaten in northern Italy have all been served in soup plates (flattish bowls) and eaten with a spoon - not a fork. Cut carrot into small dice, about 1/4"(.5cm). Open and drain tuna. Loosen with a fork. In medium sauce pan heat butter; add onion and carrot. Sauté 5 minutes, until starting to get tender. Before the last 2 '1/3 cups' are added put in the asparagus tips, capers and tuna. Add the Parmesan, stir, pour into a bowl and serve immediately. I skinned the thighs, but left the bone. 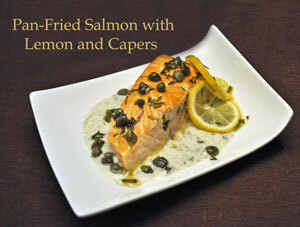 They are braised in a flavorful white wine, Balsamic vinegar and herb sauce. Add onion, garlic and sauté 5 minutes longer. Add stock, wine, vinegar, tomato paste, herbs and stir to combine. 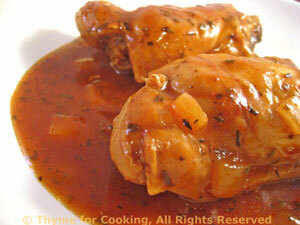 To finish: Remove thighs to a small platter. 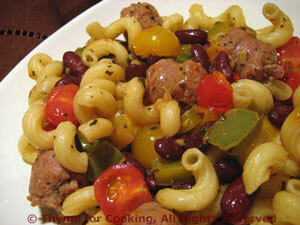 Increase heat under sauce, add cornstarch and stir until thickened and clear. Spoon over chicken thighs and serve. 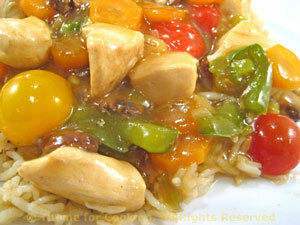 A light stir-fry for spring with cherry tomatoes and green garlic. Trim green garlic and thinly slice, including green tops - OR slice leek and mince garlic. Slice carrots into thin rounds. Add carrots, pepper and sauté 3 minutes. Add green garlic or leek and garlic, mushrooms and sauté 5 minutes longer. To finish: Dissolve cornstarch in water. Add to skillet and stir until thickened. Remove from heat, cover and let rest for a minutes to finish the tomatoes. Put rice and stock in a small saucepan. Cover and cook over medium heat for length of time on package.